The best weekends are those that are unplanned. This has been such a weekend. There was early morning coffee with biscotti in bed on Saturday and again Sunday; Saturday breakfast at a French style cafe with friends, Linda and Mac; all other meals eaten out also; antique shopping on Saturday in the neighborhood; reading; watching the video, Becoming Jane; then Sunday afternoon projects. Projects: Tall husband repaired a nasty assault to our grass and sod by some workers who apparently had been looking for a utility line on the city easement in front of The Bunny Bungalow. I finished stripping and sanding a child's vintage chair which is now ready for a dark stain. Antique finds: We found a wonderful leather-bound 1776 French book at Jacques Antiques. 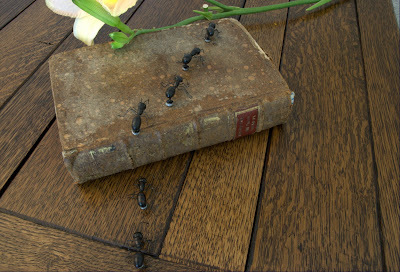 Then we could not resist the whimsical magnetic French ants at Thompson+Hanson. Our final find was an Arts & Crafts lamp table from Heights Antiques on Yale.